It cannot be denied that the new digital era brings us a lot of benefits, one of which must be mentioned here is the digital camcorder. No matter you are on a seaside holiday with your kids, attending your dearest friend's wedding ceremony, or travelling in a foreign country, camcorders can be always seen everywhere at people's hands. As a matter of fact, recording those brilliant moments is a simple, quick and fun activity, but handling those wonderful videos on PC or Mac can be sometimes a headache. Why? This is because camcorders, like Sony HDR-CX700V, Panasonic HDC-TM900K, Canon VIXIA HF S21, etc, usually come with AVCHD (MTS/M2TS) format, which is incompatible with your PC or Mac. To fix this problem, you can convert camcorder video to MP4, such as MTS/M2TS to MP4, MOD to MP4 which is the most widely used format nowadays, for playback on your computer and mobile devices like iPhone, iPad, iPod. You might wonder how to decode camcorder videos (.MTS/M2TS files) to MP4. Well, never mind, this tutorial will share you a professional converter to do you a favor, that is MacX Video Converter Free. This utility does a perfect job in putting MTS/M2TS videos to MP4 format, so that you can enjoy them on iPhone, iPad, iPod, etc. What's more, you can change AVCHD video to AVI file to upload to YouTube for sharing the special moment with your friends. Step 1: Load Video File. After free downloading this top video transcoder on Mac (or Windows version for PCs) and run it, click "Add File" to load the AVCHD files. Step 2: Select Output Format. Choose "to MP4" as your output format. What's more, your presetting can be customized to make the output video look great on your player. Step 3: Select the Output Folder. Click the "Browse" button to choose the path where you want to save the output files in. Step 4: Press the "RUN" button. 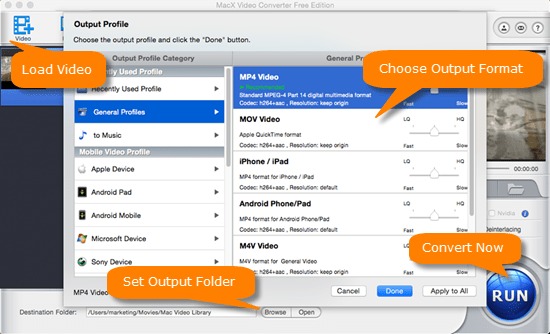 Click the "RUN" to start converting camcorder AVCHD video to MP4 on your Mac. This app will automatically helps you finish conversion, and you could view the conversion progress and are able to cancel the process at anytime. If you think that this Mac software only has the above mentioned features, then you will be definitely wrong. Besides transferring camcorder video to MP4 format, it also works well in free changing WMV video to MOV, AVI to MP4, MKV to AVI, VOB to MP4, MOV to MP4 etc. to YouTube, iMovie, iPhone, iPad, iPod, Blackberry and so on. All it can happen in a few clicks. Free download the free AVCHD video decoder - MacX Video Converter Free to easily and fast transcode AVCHD MTS M2TS to MP4 with high quality reserved for limitelessly playback on iPhone X/8/7/6s/Plus, , iPad Pro/Mini 4, Galaxy S8, QuickTime, game consoles, etc. How to encode MP4 AVI WMV MOV on iMac/Macbook.